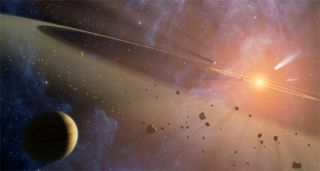 This artist's conception shows the closest known planetary system, Epsilon Eridani, surrounded by two asteroid belts (inner belt shown as yellowish ring and outer belt seen in the foreground) as well as possible planets and an outer ring (see comets originating from the outer ring in the upper right corner). A nearbystar, visible with the unaided eye, is ringed with two rocky asteroid belts andan outer icy halo, making it a three-ring cosmic circus. The inner asteroidbelt appears to be a virtual twin to the belt in our solar system. Thepresence of the separate rings of material around the nearby star, called EpsilonEridani, suggests unseen planets lurk there, where they confine and shape therings, say the researchers. If therewere in fact rocky planets within the inner gap between the star and asteroid belt, the worldswould likely reside within the star's habitablezone where temperatures would be such that life could survive. EpsilonEridani is slightly smaller and cooler than the sun. And it's also younger.While the sun is an estimated 4.5 billion years old, Epsilon Eridani has beenaround for just 850 million years. "StudyingEpsilon Eridani is like having a time machine to look at our solar system when it wasyoung," said researcher Massimo Marengo, an astronomer at the Harvard-Smithsonian Center for Astrophysics in Massachusetts. Astronomershad known about the star's outer icy ring, but they were surprised when NASA?sSpitzer Space Telescope revealed two rocky rings between the icy halo and the star. EpsilonEridani?s second asteroid belt is 20 AU from the star, or about where Uranus isin relation to our sun, and it is crowded with as much mass as Earth?s moon. The outericy ring, previously observed, extends about 35 AU to 100 AU from EpsilonEridani and is similar in composition to our Kuiper Belt, a region of icyobjects beyond Neptune. Eridani's outer ring holds about 100 times morematerial than ours, however. The ringsformed when the system was very young, likely when collisions between planetsand other smaller bodies resulted in small bits and big chunks of debris thattook shape as the asteroid belts and icy ring, the researchers suggest. And the gapsbetween these rings were likely shaped by planets whose gravitational forcescould remove any excess material flung from the belts, while also keeping theshape of the rings. Planets in our solar system exert similar shaping effects. "Thebig planets that are now keeping those gaps are determining the geometry of thesystem of rings," Marengo told SPACE.com. He and hiscolleagues propose three planets with masses between those of Neptune andJupiter could be in orbit about Epsilon Eridani. A Jupiter-massexoplanet was detected in 2000 by the radial velocity method in whichastronomers look for wobbling motion of a star due to the gravitational tug ofa planet. That planet is located near the edge of the innermost ring. A secondplanet must lurk near the second asteroid belt, and a third at about 35 AU nearthe inner edge of Epsilon Eridani?s Kuiper Belt, the researchers say. Terrestrialplanets could reside inside the innermost asteroid belt as well, though therecurrently is no clear indication of that, Marengo said. The research will be detailed in the Jan. 10 issue of The Astrophysical Journal.